CAIRO -- Masked militants riding in three SUVs opened fire Friday on a bus packed with Coptic Christians, including many children, south of the Egyptian capital, killing at least 28 and wounding 22, the Interior Ministry said. No group immediately claimed responsibility for the attack, the fourth to target Christians since December, but it bore the hallmarks of the Islamic State of Iraq and Syria (ISIS). The attack came on the eve of the start of the Muslim holy month of Ramadan. 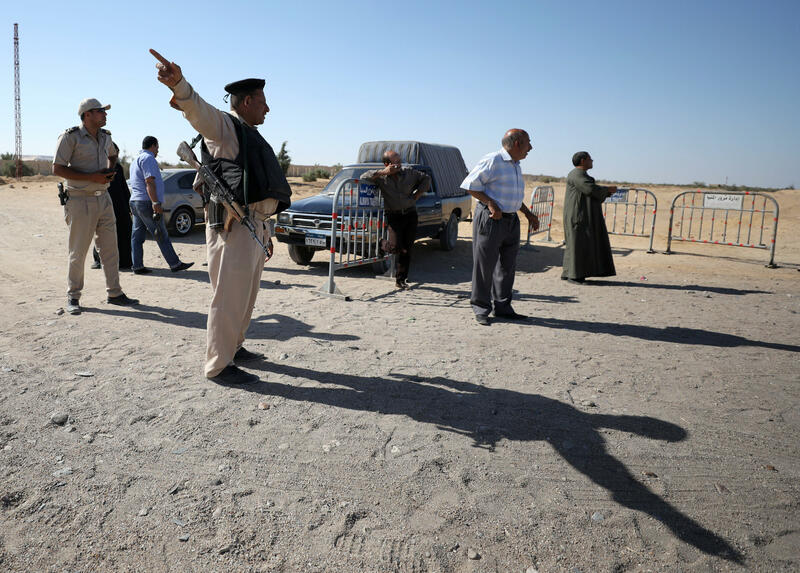 Local health officials said the attack happened on Friday while the bus was traveling on the road to the St. Samuel Monastery in the Minya governorate, about 140 miles south of the Egyptian capital. Eyewitnesses told Egyptian media that around 8:45 a.m. local time, about 10 masked men with assault rifles, some dressed in military uniforms, emerged from vehicles and sprayed the bus with bullets. Some of the gunmen went into the bus and continued to fire on the passengers, many of whom were women and children, according to the witnesses. The attack lasted just a few minutes, after which the attackers fled the scene. They governor of Minya said Egyptian police had launched a manhunt for the attackers and set up roadblocks in the region. Khaled Mogahed, the Health Ministry spokesman, said the death toll stood at 28 but feared it could rise further. According to Copts United news portal, only three children survived the attack. It was not immediately known if most or all of the victims were children. In April, ISIS suicide bombers struck hours apart at two Coptic churches in northern Egypt, killing 44 people and turning Palm Sunday services into scenes of horror and outrage at the government that led the president to call for a three-month state of emergency. President Abdel-Fattah el-Sissi called for a meeting with top aides to discuss the attack. Late last month, Pope Francis visited Egypt, in part to show his support for Christians in this Muslim majority Arab nation who have been increasingly targeted by Islamic militants. During the trip, Francis paid tribute to the victims of the December bombing at Cairo's St. Peter's church, located in close proximity to Cairo's St. Mark's cathedral, the seat of the Coptic Orthodox Church. Following the pope's visit, ISIS vowed to escalate attacks against Christians, urging Muslims to steer clear of Christian gatherings and Western embassies, saying they were targets for the group's followers. Egypt's Copts, the Middle East's largest Christian community, have repeatedly complained of discrimination, as well as outright attacks, at the hands of the country's majority Muslim population. They account for about 10 percent of Egypt's 93 million people. They rallied el-Sissi, a general-turned-president, when he in 2013 ousted his Islamist predecessor Mohammed Morsi, who hails from the Muslim Brotherhood group. Attacks on Christian homes, businesses and churches subsequently surged, especially in the country's south, the heartland of Egypt's Christians.